“There are very few flavors that are as iconic to a region as Crabfries seasoning is to Philadelphia,” said Herr’s president and CEO Ed Herr. What do you get when you combine a signature Philly flavor with a popular summer snack? You get a crabby stroke of snacking genius. For Herr’s, that’s exactly what happened when Chickie’s & Pete’s whipped up a few hundred servings of kettle corn dusted with its signature crab seasoning and sold it in a limited batch to hungry crowds at Penn’s Landing and Wildwood Boardwalk. 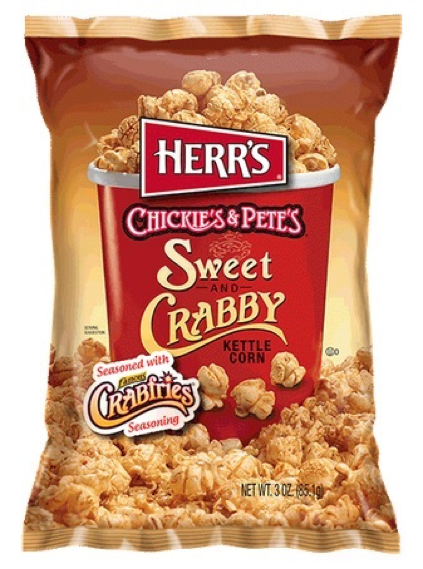 The success of the snack inspired Herr’s to partner with the Philly brand to turn the snack into its new Chickie’s & Pete’s Sweet and Crabby Kettle Corn. The flavor marks the second partnership between Herr’s and Chickie’s & Pete’s. The duo also teamed up in 2016 to create Chickie’s & Pete’s Famous Crabfries Potato Chips. 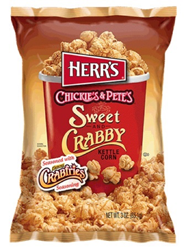 According to Ciarrocchi, Herr’s “nailed it” when it came to recreating the flavor of the initial batch of the sweet and crabby offering. Chickie’s & Pete’s Sweet and Crabby Kettle Corn is available in 3-ounce bags at Wawa, Acme, Giant Foods and Weis Markets locations throughout Philadelphia and New Jersey. For more information about Herr’s and its products, visit Herrs.com or join the conversation at Facebook.com/Herrs. A recognized leader in the snack food industry, Herr Foods Inc. is headquartered in Nottingham, Pennsylvania. The family-owned-and-operated company began over 70 years ago in Lancaster, Pennsylvania, and now employs over 1,500 people who make over 340 delicious snack products that are available worldwide. Herr’s offers a wide range of snack items, including potato chips, kettle cooked potato chips, baked potato chips, cheese curls, popcorn, pretzels and more. For more information, visit http://www.herrs.com, like the brand on Facebook or follow it on Instagram.